Wedding Compass is a free resource that provides engaged couples with the tools to search and find wedding locations and venues. Collect revenue from your subscribers, and advertise easily. 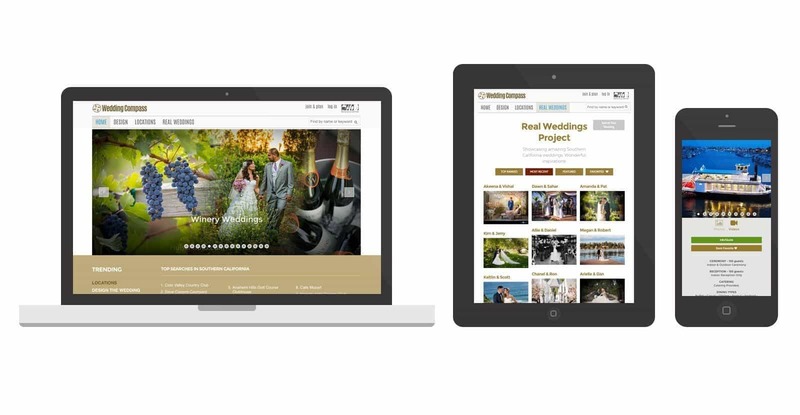 When Wedding Compass first contacted Spark Logix Studios, their website was woefully out of date. It had been built many years prior, and as design trends changed and updated, the site began to lose customers and users. They wanted a complete site redesign, and some additional functionality added to what they had. Spark Logix Studios was happy to help. The Client provided the designs, and asked Spark Logix Studios to take those design files, and adapt them for responsive design. We were more than happy to help. With our powerful framework, we can adapt most any design, ensuring that the pages stack and flow properly on any device. We also made suggestions on layout and user flow, to ensure users had the best possible experience on the site. The Client also needed some heavy custom functionality. Using a combination of plugins built by third parties and custom coding, Spark Logix Studios was able to create this functionality at a mere fraction of the cost had it been coded from the ground up. Users who come to the site can favorite the various venues they like, and return to that list to review and contact the advertisers. Advertisers can sign up for one of three different account levels with three different monthly costs. These account levels determine what information is displayed on the site, and where (the higher end advertisers getting more exposure, can display more info, and appear in better slots on the site). Advertisers can then upload images, edit their content and contact info, and receive leads from site users. This was an incredibly complex system to set up, but thanks to our extensive knowledge of plugins and code, we were able to get what the Client wanted at a fraction of the development time and cost. Another gorgeous e-commerce build from Spark Logix Studios, thanks to WooCommerce and our powerful Respondo framework!